is strictly reserved for masochists. One of the most mentioned studies that comes up in pop psychology is that of the the bouba kiki effect, which was the result of a study conducted by the gestalt psychologist Wolfgang Köhler (who while in Germany, and in the possesion of balls of steel, denounced the Nazi party publicly in 1933).This now famous study can be found in almost any psych textbook, as well as more recently Boing Boing. The test is simple, a subject is presented with two pictures next to each other. One is a bouba and the other is a kiki. Which one is which? 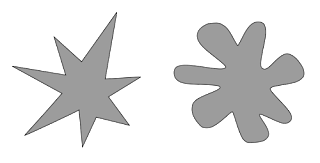 If you said that the left image is a kiki and the right round shape is a bouba then you would be in line with about ninety percent of Spanish and English speakers who took this test. In fact, the only people who are behind the standard bell curve are the autistic. One explanation given for why we do this is that during articulation, a rounded shape of the mouth is needed to say "bouba" and a more angular mouth shape is needed to say "kiki". However I would be more interested in the names people would come up for these objects on their own. After all, would these rules apply outside the constraint of only two names? After all ks and is are pointy letters, while all the letters in "bouba" are round. Would speakers of languages that uses different alphabets show us different results? Is the shape of our letters based on how we articulate the phoneme or how it sounds? When I am finally able to return home I am going to print out this picture and see what I an get people to tell me, outside of the constraint of two names.